It sometimes happens in restaurants, that the choicest cuisine is completely undone by poor service, unpleasant surroundings, or a dull atmosphere. But sometimes too, the fare is completely outdone by exceptional service, fascinating surroundings or a fabulous atmosphere. And so it happened, at Rio’s Zozo, that the most succulent churrasco and the ultimate caipirinha were almost totally eclipsed by the service, the décor and the ambiance. 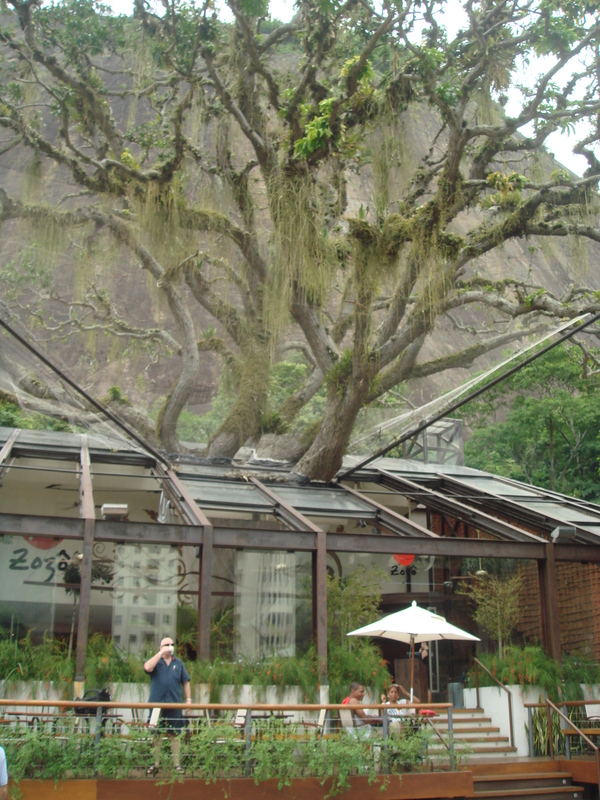 The front windows and veranda of Zozô look out across a busy square at Praia Vermelha into the majestic profile of Pao d’Acucar. On one side is the Naval Academy and on the other the cable car station. The restaurant’s back windows and roof stare straight into a massive rock of the same rounded shape, without foothold, as Uluru and of the same grainy, grey hue as Pao d’Acucar. From the floor a tree spreads giant limbs out and up, through the roof. It pushes against the rock and throws constantly shifting shadows on the floor. Torn between the amazing setting and the stunning view, it’s difficult to give due attention to the impeccable dishes of churrasco that appear on the table and to the team of Latin Lotharios in suits who deliver them. 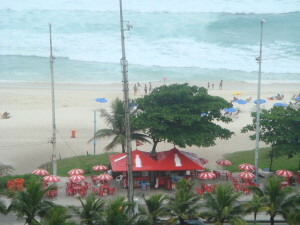 But it’s worth wresting the eyes away from the cinema outside the front window, the waiters, the tree and the overhanging rock to browse at the buffet which offers everything from sushi to acai na tigela. It’s worthwhile, too taking a stroll past the great tree to see the row of recessed “altars” with their statues of the Holy Family and the saints all dressed in luxurious cloth and surrounded by candles and votive offerings. While feijoada is Brazil’s national dish, the caipirinha is its national drink. The two make great companions. The cold, tart, light cocktail is a fabulous foil to the rich, hot, salty feijoada. 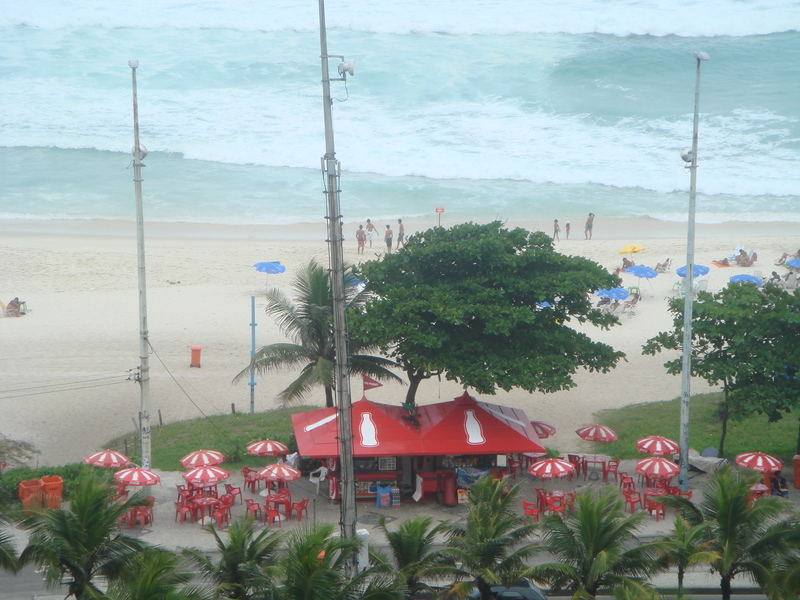 However the caipirinha also goes brilliantly with churrasco, with the little crisp fried fish served in the beachside kiosks or with the simple spiced nuts peddled by the kids from the favelas. As a stand alone it’s sensational. At home, in the restaurant, in the bar or on the beach, it never fails to “create a sensual and relaxed atmosphere” according to Ernesto Britto of Clube da Caipirinha. The name caipirinha comes from “caipira” which means, in English “hillbilly”. It is difficult to reconcile the notion of the rough bumpkin with the classy cocktail which is prepared with minute attention to detail and served with such dash and panache in bars all over Brazil. But, like the hooch and moonshine of the USA, the cachaca (fermented and distilled sugar cane juice) which forms the alcoholic base of a caipirinha, has its roots in hillbilly country. As well as cachaca, the caipirinha includes limes, cane sugar and ice. Each drink is individually and painstakingly prepared with a special instrument called a muddler. It’s a long wait for a round, but it’s definitely worth it. Sipped through a straw, it’s a long-lasting drink, with a long-lasting effect too! Although Brazilians have been quaffing caipirinha for centuries, until quite recently it was almost unknown elsewhere. Now it is one of the world’s most popular cocktails and has been designated as one of the official cocktails of the International Bartenders’ Association. Where cachaca is unobtainable, enterprising bartenders have come up with some passable variations, like the Caipivodka and the Caipiroska made form vodka, the Caipirissma, made from rum and the Caipirao made from Portuguese licor beirao. Local Brazilain variations, known as batida, exist too, like the Caipifruta. Still with its cachaca base, the Caipifruta adds condensed milk and crushed fruits like tangerine, lime kiwi fruit, passion fruit, pineapple, lemon, grapes, caja and caju. Nothing, however, compares to the classic lime, sugar, cachaca and ice Caipirinha!